The region around Mont Blanc, highest mountain in Western Europe (4,810m/15,780ft), is home to some of the best alpine walking and trekking in Europe, providing walkers with an opportunity to sample the culture and flavour of the three different countries which share the massif: France, Italy and Switzerland. 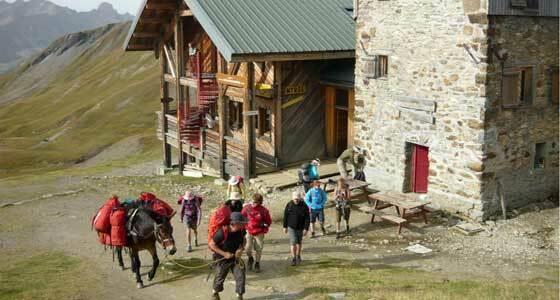 Our trekking holidays around Mont Blanc are dominated throughout by views of the highest peaks in the Alps. Mont Blanc is permanently covered in snow and ice, hence its name. The literal translation for Mont Blanc is ‘White Mountain’. In French, the mountain is often referred to as La Dame blanche ("the White Lady") and in Italian Mont Blanc is often referred to as Il Bianco ("the White One"). The Mont Blanc massif was first climbed in 1786, and the ascent gave birth to modern day mountaineering. It is not only a region for climbers however, trekking around Mont Blanc has become so popular that the region is now the third most visited natural site in the world. Anyone who travels here on a walking holiday will soon see why. On a walking holiday in the region around Mont Blanc you will have the chance to savour the food and wine of France, Italy and Switzerland and enjoy some of the finest scenery in the world. 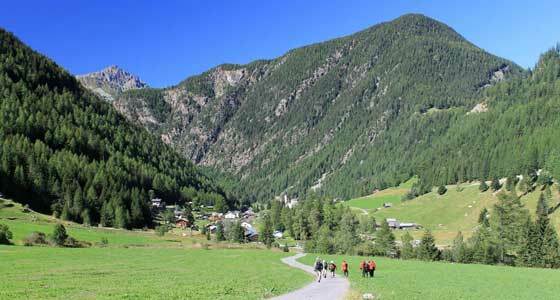 Walking routes follow ancient pack animal routes with each ascent to the next pass rewarded by a new and exciting vista of the great peaks of the Alps. The walking season around Mont Blanc runs over the summer from June to September, when the weather is warm and walking conditions are at their best. Note: Early in the season you may encounter snow on the passes which may be quite deep and alter the grading of the trip to advanced. At any time during summer, weather conditions may be variable and you should be prepared for all conditions including snow, ice, strong sun and extreme winds. In the Mont Blanc region, Sherpa Expeditions offers one of the classic mountain walks of the world, the Tour du Mont Blanc (TMB). 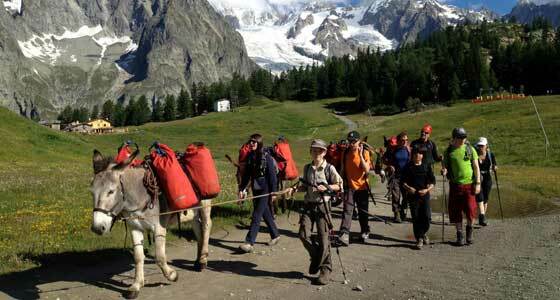 This is a long walk of 14 days in the valleys, foothills and high passes of the Mont Blanc massif. The traverse of the high passes takes you beneath spectacular glaciers and at other times you pass through Alpine villages and summer meadows. 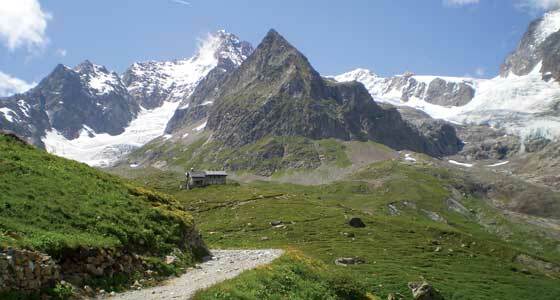 The Tour du Mont Blanc is however well within the scope of most walkers and while we grade it 'Moderate to Challenging', the trails are well defined and easy to follow. The trail is mostly moderate, but with a few challenging ascents and the satisfaction of completing one of the world's great walks provides the finishing touch to a wonderful holiday. Unlike many of our other self-guided walking holidays, our Tour du Mont Blanc holiday is arranged on set departure dates to spread the huge cost of moving baggage. This means there will be a number of other groups of our clients (up to 15 people) walking on the same schedule and you can walk with others or independently as you choose. This system also helps single travellers as they can sometimes be paired up with others, if they are prepared to share a room and thus save single supplement charges. If you are short on time, but would still like to enjoy a self guided walking trip to Mont Blanc, our Mont Blanc Classic Walk might be for you. If you would prefer to enjoy Mont Blanc on a guided walking holiday, then our Mont Blanc Guided Walk or Mont Blanc Family Adventure could be a great option for you. Joining an international group led by a bilingual mountain guide, the emphasis of this walking holiday is on full immersion into the sublime mountain culture.